Join us as we begin a series of Cascadian Gatherings throughout the Pacific Northwest, beginning in Portland on June 29th, Seattle on the 30th, and ending with a regional convergence with others from Vancouver and around British Columbia on July 1st at the Peace Arch, on the Canadian/US border. Help us broadcast this event far and wide! A Cascadia gathering in every city June 29th and 30th, a 2012 regional convergence on the Peace Arch on July 1st. 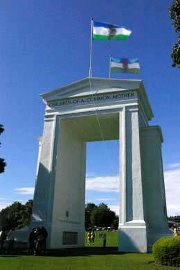 Rising to a total of 20.5 meters, 67 feet it is inscribed with “Children of a Common Mother” on the United States side as well as “Brethren dwelling together in unity” facing Canada and underneath both, within the arch itself it reads “May these gates never be closed”. Details will be added as soon as we get them confirmed. If you can’t make the events in Portland or Seattle, hold a gathering in your city or region and join us at the Peace Arch. Show your support, and we’ll get you added to our list of events. We are also looking for organizational partners to help us put on this event. If you, or a group you work with, would like to help contribute in any way, please just contact us and let us know. We will be working to try and provide everyone with ride-shares and crash space if they need it, so just leave a comment or message us directly and we’ll try to get to you. Also, if you are planning to attend and have extra room in your vehicle, please contact us.